Abdelkader Bensalah, the speaker of parliament's upper house, succeeds long-term President Abdelaziz Bouteflika, who resigned last week. Mr Bensalah has pledged to organise free and fair elections within 90 days. "We - citizens, the political class and state institutions - must work to ensure the conditions, all conditions, are right for a transparent and regular presidential poll," he said during a televised address on Tuesday. 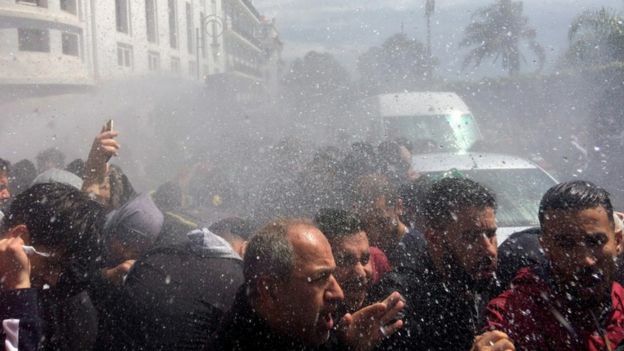 As soon as the appointment of Mr Bensalah was announced, protesters took to the streets of the capital, Algiers, demanding "Bensalah go". One protestor, speaking to the BBC's Orla Guerin at a demonstration, said people believed greater change would come. "It's going to be complicated, it's going to take some time," one woman said. "It's going to take probably a long time but it's going to happen sooner or later - we believe in this."